Send us a picture of your trailer and we will do the rest. Simply take a picture of the sides of your trailer that you would like to add graphics to and we will design/layout all the graphics for you. 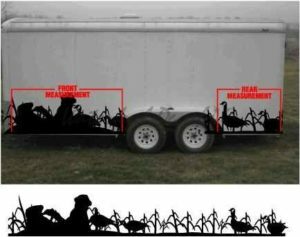 Picture of each side of your trailer that we are adding graphics to. This need to be a straight on view, looking at the trailer as if it were a canvas that you were going to paint on. The dimension of the flat face of the trailer, if your trailer has rounded corners, please measure from the start of the flat to the end of the flat surface. If you have an idea on what images you would like us to use, please provide the image numbers. Please note that this service requires a $25.00 deposit that will be applied to the purchase of your final design. Please send information along with your order number to Joe@HuntEmUp.com and we will get started.